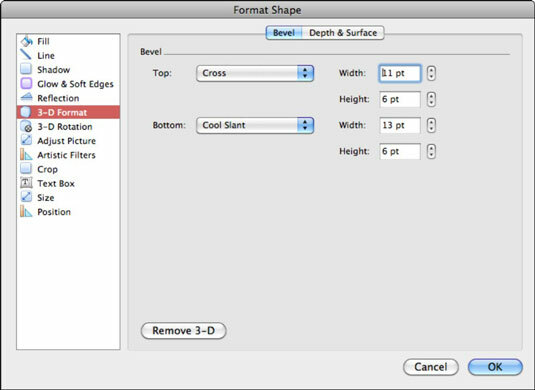 Bevel Top and Bottom: Click either control to choose from several pre-formatted styles. 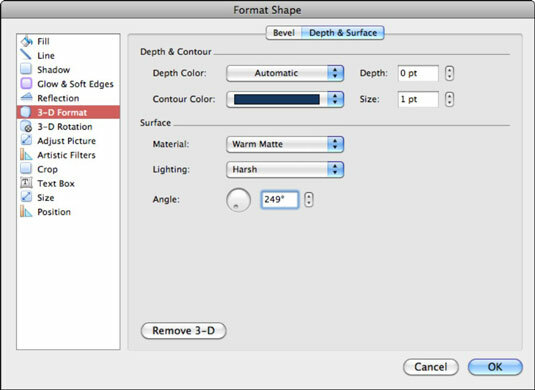 Bevel Height and Width: Use the spinner controls to make adjustments. The Depth & Surface tab offers two sections: Depth & Contour and Surface. If nothing seems to be happening when you adjust these controls, first apply a 3-D rotation (discussed in the next section). After you rotate the shape, you can see what happens when you adjust the Depth & Contour controls. Depth Color and Contour Color: Click to display the colors palette. Depth: Use the spinner control to increase and decrease depth. Size: Use the spinner control to adjust size. Smaller is often better. Surface Material: Click to choose from a pop-up menu. Lighting: Click to choose from a list of fancifully named effects. Angle: Use spinner controls to change the angle of the light source. Rotation type: Choose from several types, including oblique perspectives. Axes X, Y, and Z: These options refer to the axes about the center of the shape. The axes do not display on screen; you have to use your imagination. Use the rotation buttons or spinner controls to rotate the shape about the axes. Perspective: Increase and decrease perspective using the arrows or the spinner controls. Distance from Center: This is the distance from the center of the shape, which is where the axes cross. 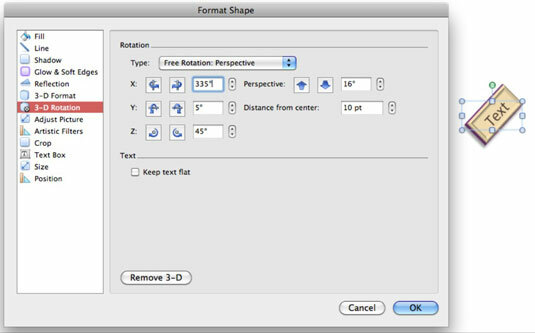 Keep Text Flat: When selected, keeps text in the shape in the same relative position.